Covered paper holder filled with CALLAHEAD toilet paper • Separate urinal • Handwashing sink with easy foot activated pump for hands free washing • Mounted soap dispenser filled with antibacterial soap • Mounted twin sheet paper towel dispenser filled with 250 sheets of paper • Translucent roof for bright natural light • Elongated comfortable toilet seat • Occupancy Sign visible to other children waiting to use the port a potty • Door is spring loaded, lightweight, and self-closing twin sheet polyethylene • An interior lock on the portable toilet that is easy for kids to open and close by just sliding left to right • Portable toilet has excellent ventilation to eliminate odors but also has CALLAHED's own HEADMIST for continuous time released fresh scent • CALLAHEAD's own HEADLINERS installed directly above the toilet seat filled with 250 sheets so every child will have a clean and dry toilet seat • A beautiful floral arrangement hung on the interior • CALLAHEAD brand signage on the exterior walls of this kid only portable toilet, designed with festive balloons especially for the PURPLE POTTY revealing that you rented the best portable toilets available in New York. • Port a Potty's Weight - 160 lbs. • Portable Toilet's Lightweight Door Opening - 22.5" x 54.75"
• Floor to Step Stool Height - 8"
• Toilet Seat Height From Step Stool - 12.25"
• Sink Height From Top of Step Stool - 25"
The PURPLE POTTY is CALLAHEAD's child size portable toilet that was designed especially for young children. All children at your special event are sure to feel special when they see they have their very own portapotty to use when they have to use the bathroom. Small children will not be intimidated by this mini portable toilet like they can be with standard sized porta potties. The PURPLE POTTY has its very own hand washing sink so kids will be able to practice proper hygiene. Parents will be especially grateful to see the PURPLE POTTY kids' portable toilet designated for their children's bathroom use only. 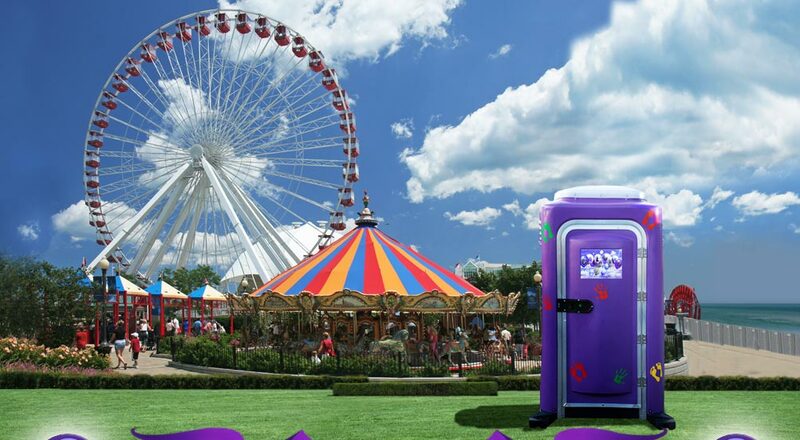 The PURPLE POTTY will provide moms and dads peace of mind for their child's sanitary protection when they use a "kid's only" porta potty. This port o pottie was created with a child's smaller size and comfort in mind. Parents won't have to try to convince their child to use the PURPLE POTTY either. 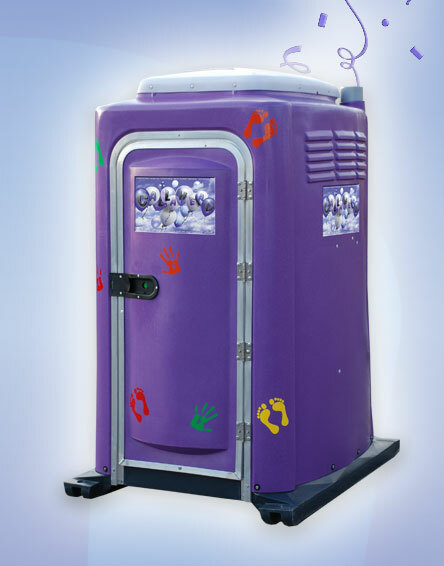 Its bright purple color along with florescent colored child sized hand and foot prints make the PURPLE POTTY appealing to every child at your event. We even designed a special CALLAHEAD sign of Purplish Blue balloons to look festive for young children while adding to the décor of any party or special event. Kids will definitely be excited to use the port a potty that is exclusively for them. CALLAHEAD's PURPLE POTTY has a toilet bowl which is easily accessible for even small children to reach because of a built-in step stool. Little kids just step inside the PURPLE POTTY, and have easy access utilizing the step stool to sit comfortably on the toilet seat. The floor is skid proof so you won't need to worry about a child slipping on a wet floor. A covered toilet paper holder is conveniently placed near the toilet seat for small hands to reach. There is a separate urinal that will help keep the PURPLE POTTY portable toilet cleaner too. The port a potties hand washing sink is easily reached using the installed step stool and is also very easy to use by just stepping down on the foot pump for hands free hand washing. It comes fully equipped with a mounted soap dispenser filled with antibacterial soap that kills 99.9% of germs and bacteria placed just above the sink. A conveniently placed filled paper towel dispenser is also easily accessible for young kids to reach. It is extremely important for children to practice good hygiene to protect themselves from spreading illnesses to one another. As stated by the CDC (Center for Disease Control and Prevention), "Clean Hands Save Lives" http://www.cdc.gov/handwashing/. The Purple Potty has an open cavity tank to eliminate the possibility of children clogging the toilet bowl if they use too much toilet paper. The EZ clean polyethylene construction won't absorb any odor and the portable toilet's installed molded air vents will increase circulation to release odors quickly. 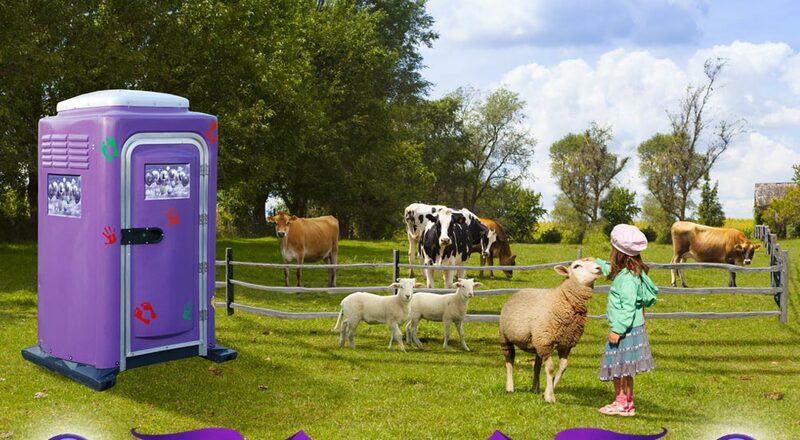 The PURPLE POTTY kid's porta potty has a white translucent roof to allow for plenty natural light inside the portable toilet, even when the door is shut completely. Below is a list of locations and jobsites where the PURPLE POTTY standard port a potty is most commonly rented and recommended for. However, this children's portable toilet is an ideal rental for any special event where children will be present. The height of this child size portable toilet is 77" where most standard sized porta potties are over 90" in height. Although this is a child size portable toilet, it is still equipped with an extra-large 60 gallon holding tank to handle heavy bathroom use. 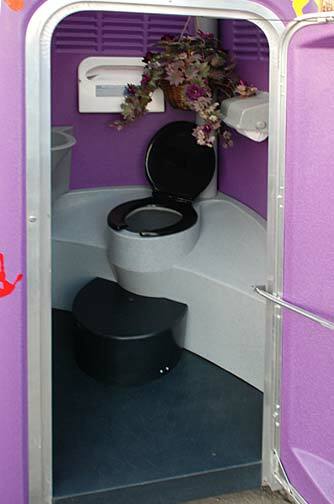 The PURPLE POTTY may be a small and inviting porta potty rental for children, but the interior has plenty of room for comfort and mobility. 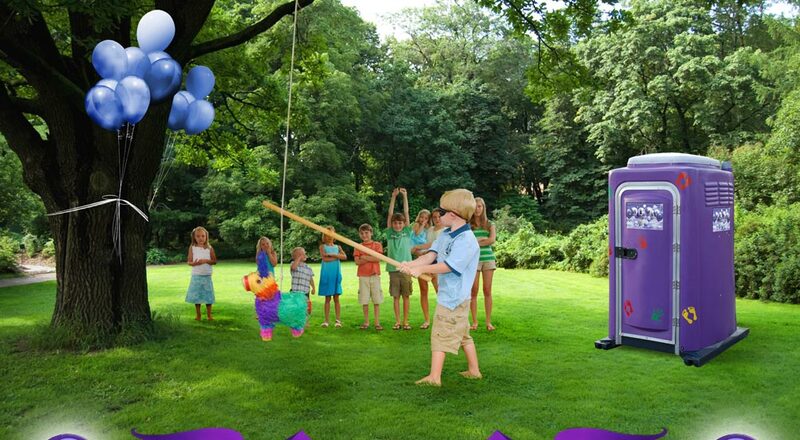 The PURPLE POTTY is the perfect portable toilet to rent for a child's birthday party, weddings, communions, baptisms, school functions, graduation parties, sporting events, park locations, beach locations, family reunions, family barbeques, or any event where young children will be in attendance. 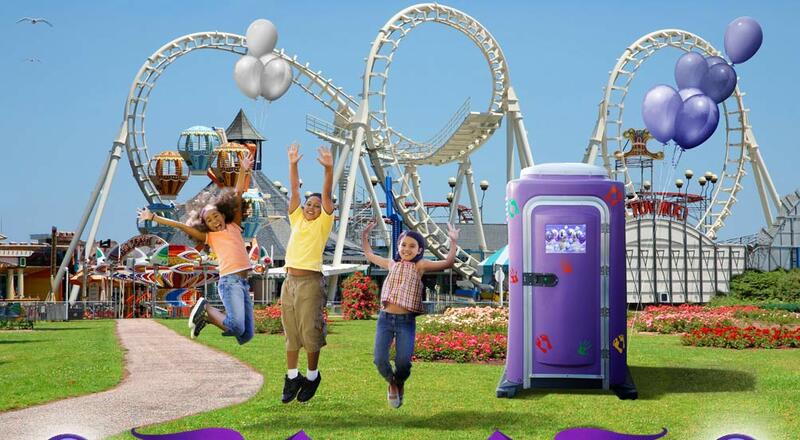 Guests with small children will be very grateful to see that you thought of their precious little ones when you rent the PURPLE POTTY portable toilet just for children to use. Additional accessories that come standard with the PURPLE POTTY child size portable toilet rental include, CALLAHEAD's HEADLINERS toilet seat covers for kids to have extra sanitary protection so they always have a clean dry toilet seat. Our HEADMIST automatic time released air freshener was installed to eliminate odors from other users. A beautiful floral arrangement is hung on the interior to add that warm inviting touch. Finally, we have installed interior rope lighting for extra special lighting for youngsters to enjoy! Bright Natural Light Through Roof!